THE STAINLESS STEEL STABILSING PLATES FIRMLY SECURE A TRANSPAC TO ANY SET OF DUAL TANKS THAT USE INDUSTRY STANDARD BANDS AND BOLTS. Curved to fit the spacing of double tanks and are the only item needed to connect a TransPac harness and a wing to a set of double tanks (a hard backplate is not needed). The TransPac harness and the wing end up being sandwiched between the double tanks and the Stabilizing Plates, with the Stabilizing Plates functioning like large washers. Sold as a pair. 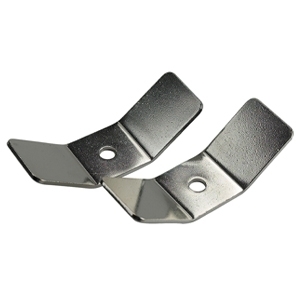 Stabilizer plates will serve as a reinforcement of the Transpac grommets and provide a more even distribution of weight from double cylinders.